The True Romance Rose Bouquet by FTD is the perfect expression of love and passion. 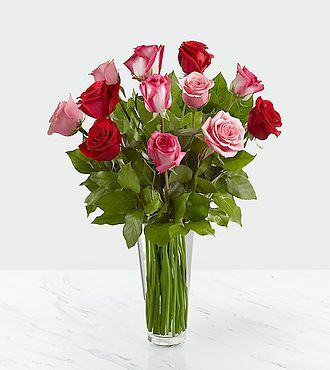 A bright burst of color, this bouquet combines red, pink and fuchsia roses, accented with beautiful greens and seated in a clear glass vase, to create a truly romantic representation of your love. You save over $11 at FlowersFast! (Compare to FTD retail price: $80 + $22.98 for same-day delivery.) You get the same quality, at a lower price! No extra charge for same-day delivery. FREE personalized gift message included. (Extra delivery charge for Alaska and Hawaii) Same-day florist delivery is available for this item, for orders placed before Noon in the recipient's timezone. Please see the Ordering and Delivery Information.